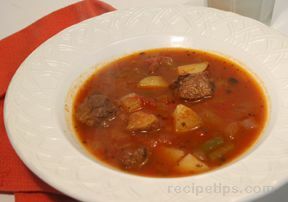 A delicious soup filled with an abundance of flavor from the combination of meat, vegetables, herbs, and spices. 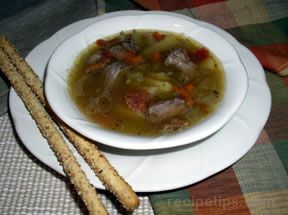 Oxtail soup is just one of the many hearty soup recipes you will find on RecipeTips.com. 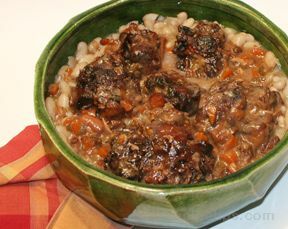 In a 4 quart pan, brown the ox tail thoroughly in hot oil. Add water, onion, garlic, celery, tomatoes, carrots, parsley, bay leaf, thyme, salt and peppercorns. Remove bay leaf, and cool slightly. 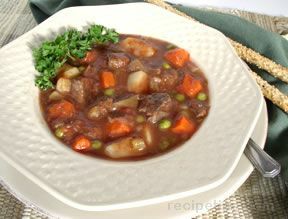 Remove ox tails and trim fat off, remove meat from bones, discard bones, add meat back to soup. Skim any excess from the soup as it cools.